Glory to God in the Highest, Ya Filthy Animals! “Love saying ‘Merry Christmas’ again,” I’ve heard a few people joke, making light of the President’s promise that he would bring Jesus’ birthday back to the White House, an invitation one imagines our Lord happily declining. “Merry Christmas” is quickly becoming this administration’s “Thanks Obama” — a sardonic slogan stripped of any real meaning; more useful to critics than allies. In 1127, a Norse historian whose name has been lost to us wrote a book which would come to be known as The Anglo­Saxon Chronicle. This volume would become invaluable to future scholars for understanding the lives of early Norsemen, but one paragraph in particular has always stood out for its dread and eeriness. Our anonymous historian wasn’t exaggerating. This ominous spectacle was a common sight throughout Europe. It was a well-­known portent of war, famine and coming calamity. An undead army racing through the night sky, their spectral forms dark and foggy, the object of their pursuit unknown but their sinister intentions apparent. It had many names. In England, it was known as the Devil’s Dogs. The French called it the Household of the Harlequin. In Gaelic it was known as The Old Army or The Troop of Ghosts. But it was the Norse who were most familiar with the tale. In fact, they believed Odin, their crafty and headstrong king of the gods, was leading the charge. And perhaps that is why it is the Norse name has been the one that has been passed down through folklore: The Wild Hunt. Notably, Scandinavian legend had it that it was easier to hear the WIld Hunt than to see it. If you stood alone after the sun went down, particularly during the bleak months of winter when the nights were at their darkest and the weather was most cruel, you may well be able to hear the yap of Odin’s ferocious dogs. It was said one loud bark followed by a second, slightly more distant bark, was a sure sign that Odin’s Wild Hunt was near. 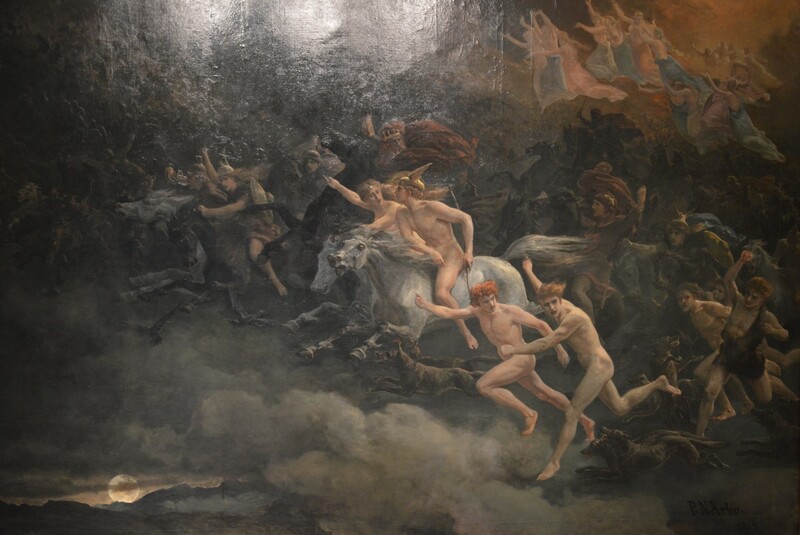 Sometimes, according to some interpretations, the Wild Hunt was led by the pagan goddess Perchta — the guardian of the beasts. Occasionally, Perchta and Odin would ride together, leading an army of dark elves from the fairy world. Their appearance prophesied a coming calamity like war or famine or, best case scenario, the death of whoever saw them. As Christianity began to spread throughout Europe, tales of the Hunt did not subside. In fact, they grew even more dark and menacing. Priests who associated pagan mythology with their idea of hell began to conflate Odin with the devil himself. Instead of portending war, the Wild Hunt was now on the lookout for the wicked and unbaptised. These demon elves would drag the unrepentant to hell. According to the German legend, Odin’s wife Perchta would sneak into the homes of the disobedient, slit open the bellies of their children and stuff them with coal. Odin would preside over the proceedings with his booming, menacing laugh. This laugh came to be his trademark. If you were alone at night and you heard an echoing chuckle in the distance, you’d better hope you’d made peace with your maker. As this interpretation became more and more common — the idea that it was indeed a satanic Odin figure leading this terrifying profession of demonic fairies — the Hunt grew more closely associated with the winter, when it was known that the fairy world and our own human one were most closely aligned. These visitors could be benevolent, like, Cupid who would float down from the clouds bringing romantic love. Or they could be wicked, like the Harlequin, the devil and ­ of course, witches, who were regarded as meddlesome troublemakers, descending from the night sky on broomsticks charmed by black magic. And they could be a little bit of both. Boiled down to their essence, fables are simply humanity’s way of explaining the unexplainable. The explanations were farfetched because life has a lot of things are difficult to explain. The explanation might morph and shift over time to come to grips with new information, or a new cultural feeling that just didn’t like the old version. Sometimes those shifts are small. Sometimes, they can be huge. Over time, new tales began to be told of the Wild Hunt. It was said that on occasion, Odin would stop the pursuit and ask mortals to mind his hounds for the evening. If they did so, he would reward them with a trifle; a flower perhaps, or even a gold coin. It was said that his demonic elves began to outfit their night horses with jingling bells, to announce their arrival. Odin’s wife Perchta was said to be fond of children – especially the obedient ones. Instead of slitting bad boys and girls open and stuffing them with coal, she merely left a little coal behind as a warning to do better in the coming year. But Catholic leaders felt that Odin was becoming a little too kindly for a pagan religion, so they started swapping him out with a certain well­known priest who had become famous for his love of gift giving. Saint Nicholas the Wonderworker took Odin’s place, the horde of demonic elves became a band of merry toymakers, and the pack of hideous hounds became a team of tiny reindeer. And yet, while seeing Santa Claus today is a sign of peace and goodwill, the hints of his earliest origins remain. On the bleakest night of winter, if you were to look up and see a stern old elf soaring through the night sky who promised to reward the good and punish the evil? Well, you would definitely hope that he was not out hunting for you. 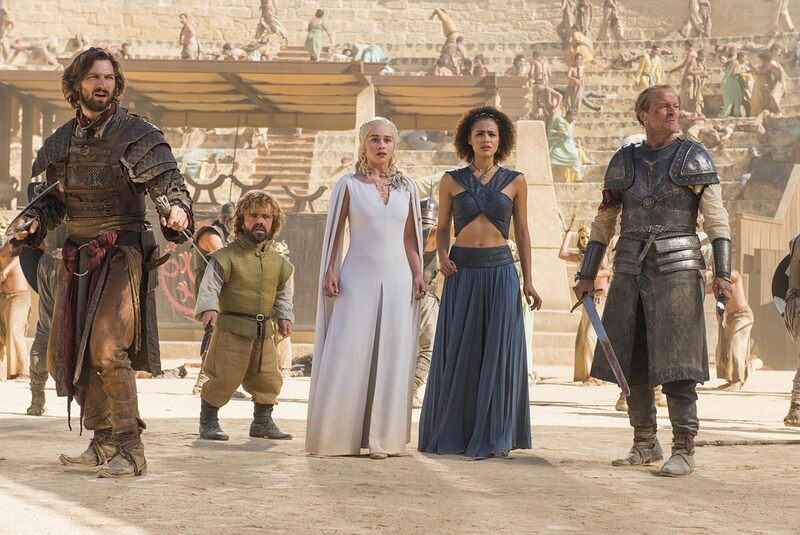 George R. R. Martin has announced that “The Winds of Winter,” the next book in A Song of Ice and Fire, will not be finished before the next season of Game of Thrones debuts—meaning the show is outpacing the books. I can appreciate Mr. Martin’s time constraints, being a famous author, so I went ahead and wrote The Winds of Winter for him. Please note, I have only read the first book and seen a few episodes of the show. The White Witch is calling for a total and complete shutdown of humans entering Narnia until our country’s representatives can figure out what is going on. According to our research there is great hatred towards Narnians by large segments of the human population. Humans have been observed fraternizing with beavers and fauns, in direct violation of local law. Moreover, a full 25% of humans entering into Narnia are believed to be noxious traitors. The human world is known to be a place of ceaseless violence, abuse and gross ignorance regarding the rights of talking beasts. This is not to say that all humans are bad. There are many moderate humans. But until we have a good way of sorting the good humans from the bad, keeping them out of Narnia is the right and sensible thing to do. Even the “good humans,” such as they are, are poorly suited for the Narnian climate, having grown up in a world where it is only rarely winter and Christmas is celebrated annually. Surely, there are other magical countries more suited to the unique needs of humans than Narnia. My name is Tyler Huckabee. I'm a writer living in the South. I've written all sorts of things. Magazines. Plays. Television Shows. Music and film reviews. This very interesting list could go on and on. Anyway, this is my homepage, the beginning of a wonderful journey. Thanks for stopping by.